If you're a hog hunter or just need a wide area of your surroundings lit up, you'll enjoy the convenience of our solar feeder lights. At Sniper Hog Lights, we are dedicated night hunters and understand what it takes to make a great feeder light. Our high quality feeder lights are capable of lighting up over 12,000 square feet in all colors. Our hog feeder lights are made from durable steel and aluminum to prevent wear and tear from the weather and curious critters. Run the feeder light all night every night or set your own time with the built-in feeder light timer. 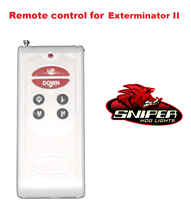 The included remote control makes it easy to adjust the settings from up to 300 yards away, so no more tracking scent into your hunting area turning on or messing with a light. Our lights work great for, hunting, camping, fishing or anything you need to light up. Available colors, Red, Green, White and Infrared. Expand your hunting view with solar feeder lights from Sniper Hog Lights today! Exterminator feeder light is capable of light up over 12000 square feet.